Plot hole: At the end of the episode, Dawson is seated in the kitchen talking to Pacey in a normally loud voice. At the same time, Joey and Charlie are awake and talking in the pup tent in the living room, very close to the kitchen. Later in the Season we learn that Joey had no idea Dawson had driven down to Florida to see her, as apparently he left without seeing or talking to her. But being in such close proximity that morning; there is no way Joey would not have been able to hear Dawson's voice as he talked with Pacey. The living room was close enough to the kitchen, so it doesn't make sense that Joey wouldn't have known Dawson was there and if she did-she would have gone to talk to him. Plot hole: Jack and Joey are desperate to get the tank pump fixed so they can put the lobsters back in. However, once the customer tells them how to fix it, they then stop for a chat, check his table for tips, read a poem, share a moment, and start cleaning counters - with no attempt to re-house the lobsters. 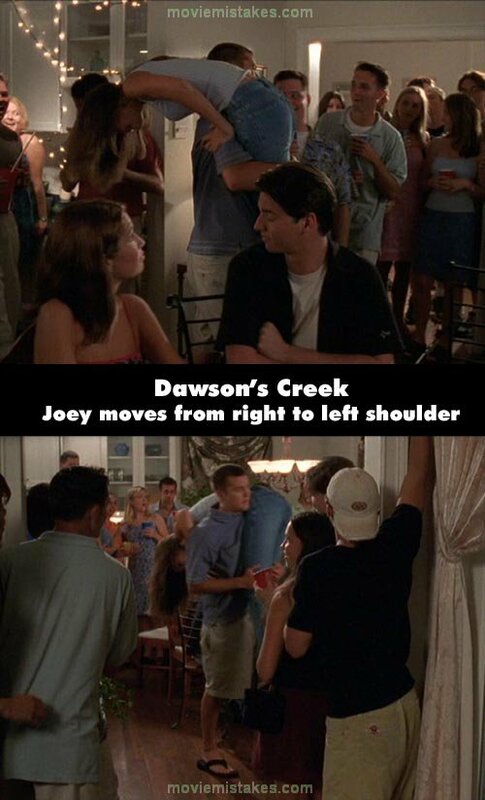 Continuity mistake: When Pacey picks Joey up to carrying her out of the party, he puts her over his right shoulder. In the next shot, just before they go out the door, she is carried over his left shoulder. Visible crew/equipment: In the scene where Joey and Pacey have arrived back at Capeside, and are getting things ready to get off the "True Love," in one shot you can see the microphone clipped to the back of Joey's shorts. Continuity mistake: When Abbie and Jen are talking to Vincent on the dock, Abbie's sheer gold shirt is up to her shoulders in the long shots, but not visible in the close ups. Plot hole: When everyone is staying at the Potter B&B, Joey mentions that it's supposed to be the coldest night of the year. Also, Mr. Fricke tells them at breakfast that the heat went out again during the night. After such a cold night and the heat going out, the house must have been freezing that morning. Yet Joey wakes up and is wearing only a skimpy sleeveless top and PJ bottoms, more like summer pajamas. She continues walking into the very cold house without putting a robe or anything else on. It looks a bit odd, considering how cold the temperature is and the fact that everyone else that morning is already wearing long sleeves. Later that morning, the house is still so cold Joey is sleeping by the fire with a blanket over her. Yet earlier that morning, she seemed to be comfortable in scanty summer PJs. Continuity mistake: In "The Te Of Pacey", Pacey's birthday takes place in winter - it is snowing and everyone is wearing heavy clothes. The other episode featuring his birthday, season 2's "Crossroads", takes place in summer (everyone is wearing shorts and light shirts). Continuity mistake: When Joey finds Dawson at Pacey's Pier Party, it is raining heavily. Both Dawson and Joey get soaked and their hair is very wet as they reunite and kiss. At this point, it suddenly stops raining and does not rain again the rest of the time at the pier. But later, when Jen and Abby are talking behind them, both times Dawson and Joey are shown from the rear their hair is noticeably dry, wavy and styled. Later, when Dawson and Joey are talking again before she goes home, their hair is once again very wet and combed flat against their heads. Also, neither Jen or Abby's hair appeared wet at all during the party. Continuity mistake: When Pacey is at Andie's house waiting for their date, he picks up a family photo of the entire McPhee family. There is a close-up of this photo, and you can see all family members including Andie's dead brother, Tim, and her father. In addition to the Father in the photo not being actor David Dukes, there is a completely different person in the photo representing Tim, the dead brother, than the actor who portrayed him in Andie's delusions later in the season. The person in the photo is sandy blond haired, and the actor who later portrayed him in the show was a different person with very dark hair. Factual error: When Jack and Andie are talking at the dinner table about her cheating on the PSAT, Jack says, "Do you really want to get kicked out of school for cheating on something that has the world 'Practice' in front of it?" PSAT actually stands for Preliminary Scholastic Aptitude Test, not Practice SAT. This is the same mistake that Pacey made in an earlier episode. Plot hole: Season 2 picks up with everyone still in Sophomore year, which continues until the end of that Season. So we are presumably well into the Sophomore school year, and yet during this episode there are suddenly elections for the Sophmore President and Vice President. It doesn't make sense they would wait until this far into Sophomore year to be electing officers *for* the Sophomore year! Too much time has passed; normally elections like that would be held at the beginning of the year so the people elected can do their jobs longer, for the entire Sophomore year. Plot hole: During this episode, Jack is at Joey's house at night for some time. Pacey and Andie obviously spend a great deal of time together that same night with dinner, a walk and the Bed & Breakfast session (and we later find out they stayed there much longer than it looked originally). It has been mentioned in the past that Jack and Andie have to 'take turns' watching their mother, and they can't leave her alone at night. Therefore - while Jack is posing for Joey for much of the evening and night, and Andie is out on a date for much of the evening and night; who is watching their mother?